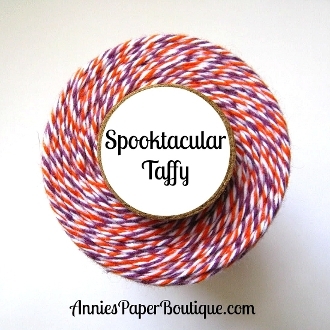 HTB Creations: Happy Halloween from Trendy Twine! Hi everyone and Happy Halloween! A few of us from the Trendy Twine Design Team joined in for a Halloween post. The sequins are also from Annie's Paper Boutique: Orange from the Autumn Sequin Mix and Purple from the Grape Licorice Batty Sequins. The adorable stamps are from Unity Stamp Company. I hope you have a fun Halloween!! Your card is super sweet! That twine is the perfect choice for it. Have a happy Halloween! Love this super cute image and it's one of my favorite cards, proudly displayed in my craftroom now!! Great job! Happy Birthday and Happy Halloween friend! Very sweet card! The image is adorable! The addition of the sequins looks fabulous! Have a Happy Halloween and a very Happy Birthday! Hope your day is fabulous! Absolutely adorable!! I love the unity stamp and sequins! This is so super sweet Helen! What an adorable Halloween card!!! Hope your Halloween was a blast!